The estate of The Beatles member George Harrison has launched a new record label, called HariSongs, featuring Indian classical and world music. The label will use archives from the Harrison family, including the musician’s performances with some famous Indian maestros like Pandit Ravi Shankar and Ali Akbar Khan. The first two projects of HariSongs will be reissues of two recently out-of-print records: Ravi Shankar and Ali Akbar Khan’s In Concert 1972, and Shankar’s collaboration with Harrison, Chants of India. Both albums were released on April 27. Harrison and Shankar’s collaboration Chants of India was originally released in 1997 via Angel Records. Harrison produced the album, which was recorded by Shankar in Chennai and Henley-on-Thames in the United Kingdom. Shankar had drawn inspiration from sacred Sanskrit texts, including the Vedas and Upanishads. The audio for this reissue was sourced and remastered from the original digital master tapes. 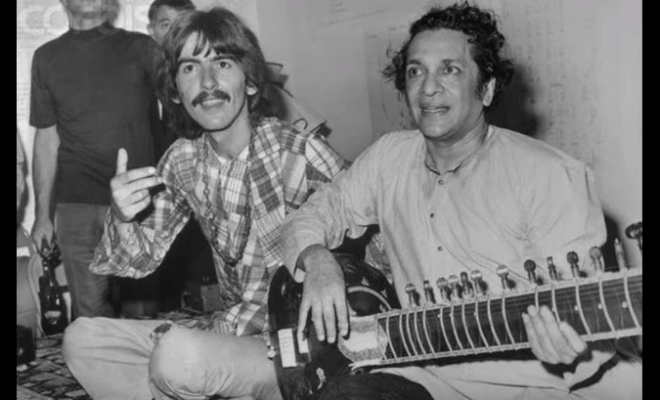 The new record label also released a short documentary about the making of the album, which features archival interviews with Shankar and Harrison. Shankar can be seen discussing the deeply personal and spiritual nature of the mantras that comprise the album, and what it took to adapt them into songs for the public. “I was in a terrific dilemma not knowing whether I’m doing the right thing,” Shankar said. “You’re not supposed to utter these mantras for everyone. They’re you’re personal thing… I worked very hard and that’s why it took me the longest ever to do [this] record, but in this I had to do a lot of self-evaluating,” he adds. In Concert 1972 was recorded on Oct. 8, 1972 by Shankar and Ali Akbar Khan at New York City’s Philharmonic Hall. The duo performed three ragas in the jugalbandi style, a duet of two solo musicians. Shankar played sitar and Khan played sarod, while Alla Rakha provided tabla accompaniment. The concert was also a tribute to Khan’s father, Allauddin Khan, who had died a month earlier. He was a musical mentor to both his son and Shankar. In Concert 1972 was first released in 1973 by The Beatles’ Apple Records. Harrison produced the record alongside Zakir Hussain and Phil McDonald. The new digital version of the record was sourced and remastered from the original analogue master tapes. It can be streamed and downloaded at https://harisongs.lnk.to/In-Concert-72. Harrison, who visited India in the 1960s, fell in love with the the sitar and Indian classical music. He met sitar maestro Ravi Shankar in the mid-1960s and was taught by him to play the instrument. “It is strange to see pop musicians with sitars. I was confused at first. It had so little to do with our classical music. 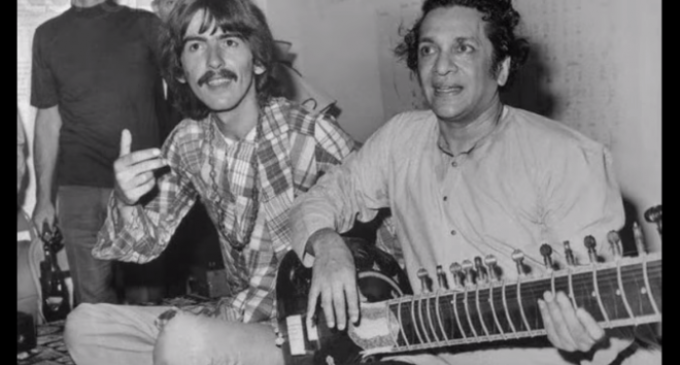 When George Harrison came to me, I didn’t know what to think,” recalled Shankar. “But I found he really wanted to learn. I never thought our meeting would cause such an explosion, that Indian music would suddenly appear on the pop scene,” Shankar said, according to a Wall Street Journal article.